Picture-perfect Palau offers stunning snorkeling and world famous diving spots. 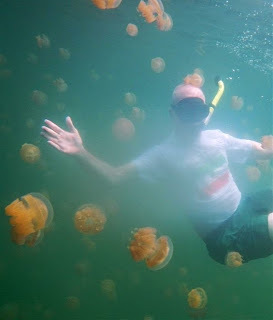 But for me, nothing beats the unique, surreal experience of Palau's incredible Jellyfish Lake. Other places also have clear water and colorful tropical fish, but nowhere else on earth can you find a lake filled with golden, stingless jellyfish! Note: This short video below takes a moment to load but it's worth it. Some browsers will not display the video, depending on embed settings. In the category of experiences with wild species, Jellyfish Lake ranks for me right up there with the mountain gorillas of Rwanda. Jellyfish are always fantastic creatures, but to be surrounded safely by hundreds, thousands really, is incredible. They pulse around at different speeds, from faster flexing babies less than an inch wide to leisurely adults up to a foot wide, creating gentle, peaceful, hypnotic rhythms. You feel like you're floating somewhere else in the solar system. The allotted 45 minutes, while good to limit human intrusion, goes by much too fast. and remnants of WWII Japanese fortifications (cannons in cave). Based in the capital of Koror, I loved my days in pretty Palau and hope to return someday. See my previous post for a summary of the curious status and background of the Republic of Palau.